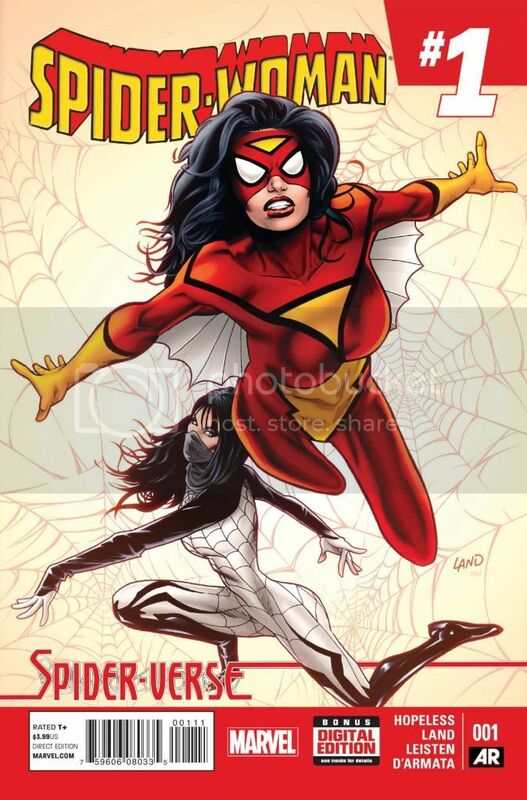 Spider-Woman #1 (Published by Marvel Comics; Review by Draven Katayama; ‘Rama Rating: 4 out of 10): This issue doesn’t feel like a #1: it feels like we’ve jumped into the middle of someone else’s arc, and essentially, we have. The tie-in to Spider-Verse doesn’t mesh well with a series launch. We learn very little about Jessica Drew, other than she is easily exasperated by Silk. Dennis Hopeless writes Silk as an interesting character, but the pacing is cluttered by too many undeveloped guest appearances. I do really like Frank D’Armata’s distressed urban landscape colors and the 1930’s alternate Earth art, with a classic car, flapper hat, and pink-feather coat being the visual highlights. Jessica needs to express a more holistic personality in her own story, beyond an overwhelmed babysitter attitude and a grim expression. This would be an unideal introduction for new readers to Jessica Drew.